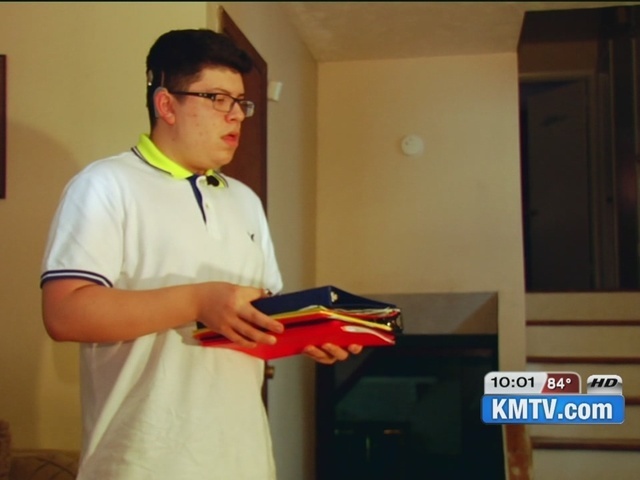 A deaf student who had his belongings thrown in a toilet at Burke High School in Nebraska says he wants to transfer out. Senior Alex Hernandez says two male students took his backpack during lunch last Wednesday and dumped his tablet, school supplies, homework and debit card in a toilet. It also contained a battery for his cochlear implant - without it, he can't hear. Hernandez says he's received much support from both close friends and people all over the country since KMTV first reported the story . "I wanted to thank all of my friends and those who wrote me for supporting me. I am very happy. It made me feel like I am not alone," says Hernandez. Hernandez says many of the people who wrote him are also deaf. "They said they felt sorry for me and had me in their prayers. They said [they] were here supporting me and they know how it feels like to be deaf. So I'm very happy," says Hernandez. Hernandez, who has been deaf since he was a one-year-old says he's gone through years of bullying due to his disability. But this past incident was more than he could handle and now wants to transfer out of Burke. "It's his decision. I support him no matter what. I definitely don't want him going to that school if he doesn't feel safe," Alex's mom tells KMTV. Alex's mom plans on going to speak to administrators Tuesday morning and pulling him out of that school and transferring him to Ralston High School. "I have friends who are hard of hearing that go there and they say it's good. They get a lot of support and they don't get bullied," adds Hernandez. Burke High School administrators say they are aware of the situation and are investigating the case. Hernandez's mom told KMTV the school notified her administrators were able to identify the two students who took Hernandez's backpack and suspended one of them - the other is still under investigation by the school. Alex's mom also plans on filing a police report against the two students. "It's not fair that the bullies think they can continue with this behavior," says Alex's mom. "They need to be reminded that there are consequences to stealing and bullying." Alex's mom adds she hopes putting more spotlight on Alex's case will bring more awareness to bullying and alert parents to communicate with their kids and make sure they're doing okay in school. "Today was my kid - tomorrow will be somebody else's."